Perform the following steps to recover the computer using a set of recovery discs (either CDs or DVDs). These discs can be a set that was received from HP Support or discs that you created. HP does not include recovery discs in the box with its personal computers as the recovery software comes on the hard drive. 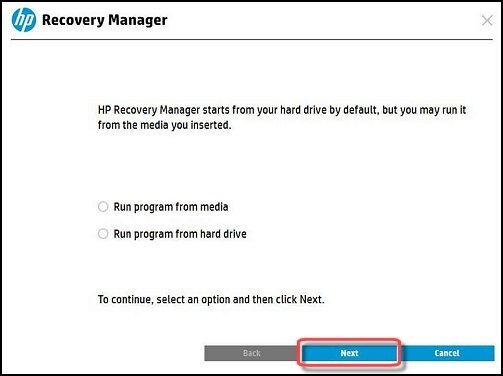 You can obtain recovery discs from HP Support or use Recovery Manager software to create a set of recovery discs yourself. 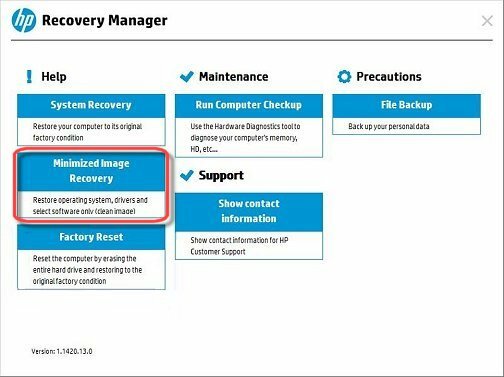 HP recommends creating a set of recovery discs when you receive your computer and storing them in a safe place. Recovery Discs sent to you from HP Support can take as long as 4 to 6 hours to complete system recovery, but recovery discs that you create often take less time to complete system recovery. For more information about creating a set of recovery discs, see Creating Recovery Discs or Saving a Recovery Image to a USB Flash Drive (Windows 8). Disconnect all connected devices and cables such as Personal Media Drives, USB drives, printers, and faxes. Remove media from internal drives, and remove any recently added internal hardware. Do not disconnect the monitor, keyboard, mouse, or power cord. Insert the first recovery CD, and then turn off the computer. With the computer off, press and hold the power button to turn on the computer. Immediately press the Escape key repeatedly, about once every second, until the Startup Menu opens. Press F9 to open the Boot Device Options menu. Use the up or down arrow key to select the CD/DVD drive, and then press Enter. More than one CD/DVD drive selection might be available from the list of bootable devices. If so, select one of the CD/DVD selections from the list to see if HP Recovery starts. If recovery does not start or a non-system disk error displays, restart the computer by pressing the power button, and then repeat these steps to select another CD/DVD drive. When recovery starts, continue using the steps to complete recovery. If you cannot select the disc drive from the Boot Menu, disable Secure Boot and enable Legacy Mode in the BIOS. For detailed instructions, see the Disabling Secure Boot on a notebook computer (Windows 8) section in this document. A window might display and prompt you to choose whether to run Recovery Manager from the hard disk or from the disc inserted. If this window displays, select Run program from media, and then click Next. Under Help, click either Minimized Image Recovery to restore only the operating system, drivers, and some software, or click System Recovery to restore the computer to its original factory configuration.